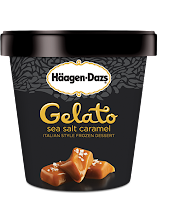 I discovered * sea salt caramel gelato * when my daughter and her girlfriend took me to Trattoria Machiavelli - conveniently right on the corner only yards from my apartment - for my birthday and I chose it for dessert. It blew my freaking mind. And then there it was at the nearby Gristedes, in one of those little mini cartons they have (97 grams) and it was just as great as I remembered. Wow. When it comes to candy bars I always avoid ones with caramel because it's just gross and chewy and sticks to your teeth and you know that virtually all those M&M/Mars and Hersheys candy bars have so much caramel in them because it's cheaper than chocolate. But when it's in ice cream (sorry, gelato - they are different enough that this stuff is labeled "Italian Style Frozen Dessert") caramel is of a much more agreeable consistency. And although Talenti makes superior gelato (and I was addicted to their mango sorbet for months) they don't offer it in those little single-serving containers and I dare not get more than a little bit at a time because I'm afraid I'll eat the whole big tub at once. I don't know if Ben & Jerry's has Gelato but it doesn't matter ~ I'm boycotting their products because.